U.S. President Barack Obama arrived in Cuba on a historic visit on Sunday, opening a new chapter in U.S. engagement with the island’s Communist government after decades of animosity between the former Cold War foes. 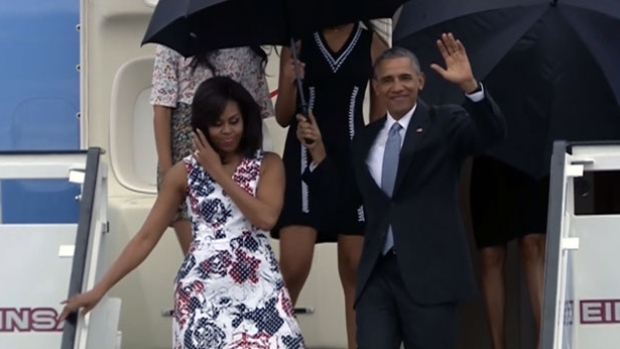 Obama landed at Havana’s Jose Marti International Airport aboard Air Force One, the iconic presidential jet with “United States of America” emblazoned across its fuselage, a sight almost unimaginable not long ago. Obama was accompanied by his wife Michelle and his daughters Sasha and Malia. From the airport, the family was scheduled to travel to the U.S. Embassy to meet staff and families. The three-day visit marks a first by a U.S. president in 88 years, resulting from a diplomatic opening announced by Obama and Cuban President Raul Castro in December 2014. One of the items on the President’s agenda will be a baseball game where he will also be bringing along the widow of Jackie Robinson. Wreath-laying at the José Marti Memorial, morning (Martí was a poet and journalist known for his fight for Cuban independence). Official welcoming ceremony, Palace of the Revolution, morning. Meeting with Cuban President Raul Castro, morning. State Dinner at the Palace of the Revolution, evening. Address to the Cuban people at El Gran Teatro de Havana, morning. Meeting with dissidents and civil society leaders, morning. 2 p.m. – Baseball game between the Tampa Bay Rays and Cuban National Team at Estadio Latinoamericano. The President will be bringing the widow of Jackie Robinson and his daughter Sharon. Robinson played in Cuba in 1947. Departure from Jose Marti International Airport en route to Buenos Aires, Argentina, afternoon. The White House has stated that Obama will not formally meet with ailing longtime Cuban leader Fidel Castro.